ooops: what's this. amount: BTC 2.30? I entered BTC 0.1. Weird. better cancel. EDIT: correction: it seems a trade actually happened: I have 2.97 USD now and BTC 0.38 left. 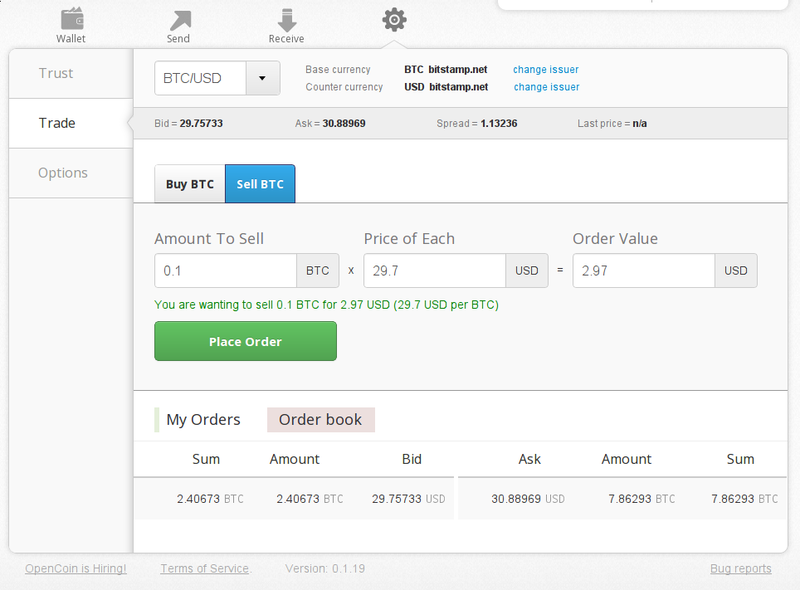 So it seems I traded 0.1 BTC for 2.97 as requested by my order. Where can I see the transactions resulting from the trade? Nothing visible in the history. I'm not sure if its related, but I set up a "trade" using your currency as the base (it was default, I only noticed it after creating the transaction). For 1 btc to 10000 XRP. Maybe it auto accepted the trade for you? Check out the trade tab under advanced to see if the offer is there for you... if so, maybe send a bug to bugs@ripple.com to tell them you didnt accept it. I can't find anything on the trade tab. Tried switching issuer to "lebing" and pair to "USD/XRP", but nothing. So, does anyone want to buy/sell BTC 0.01 (blockchain vs. ripple) with me? 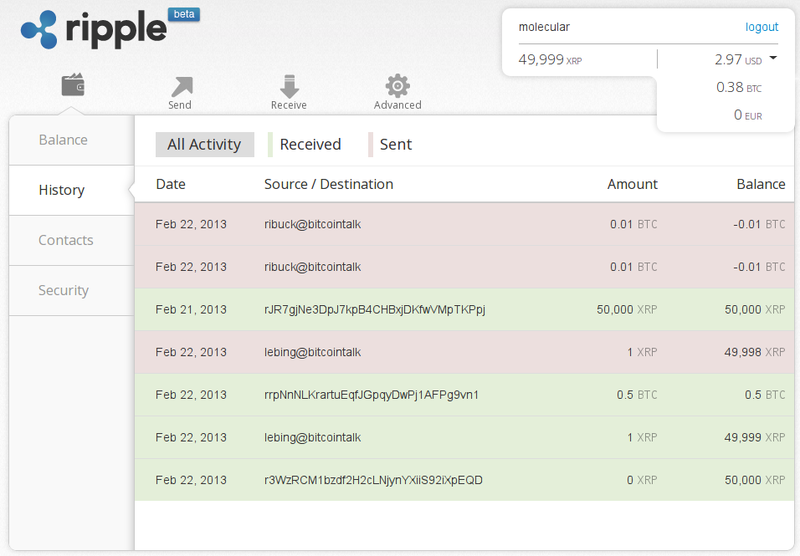 I would like to test sending Bitcoin via ripple. Yes, I'll send blockchain BTC if you want to send ripple BTC. This blows my mind. I'm quite sure this is related somehow. So did you actually make a trade of something against "BTC molecular"? Can you make a screenshot. ok, I might've found some bug... or not. Oddities at least. 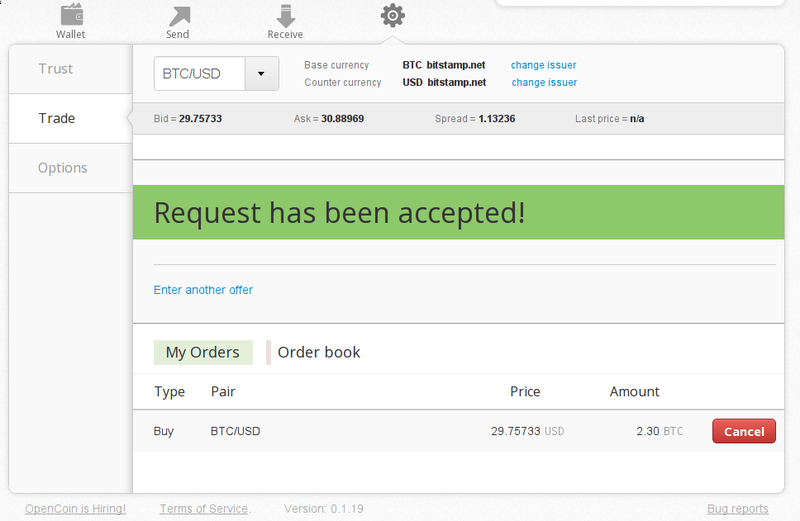 I also made a trade "on bitinstant", trading BTC 0.1 for USD 2.97. 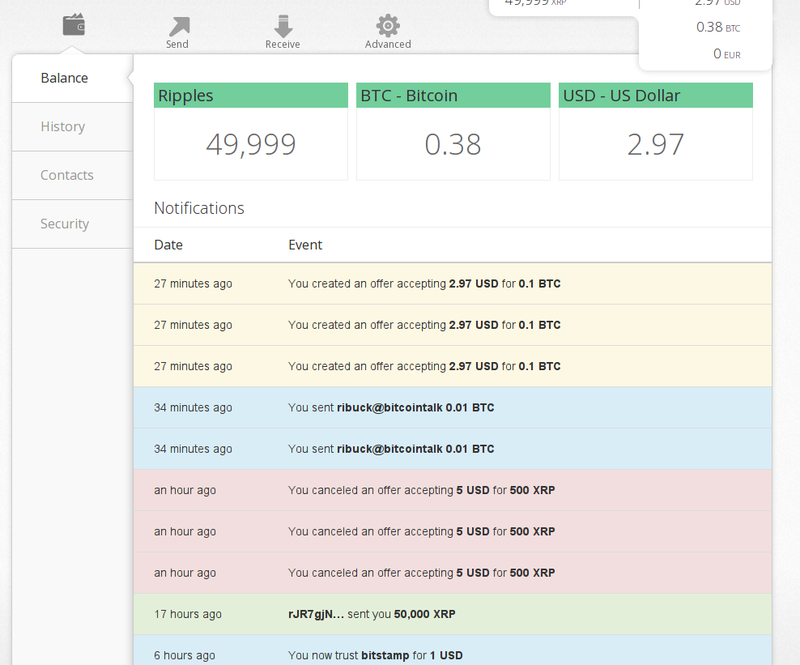 I earlier withdrew 0.5 bitinstant BTC to my ripple wallet, so I should now have BTC 0.39. However, my balance says BTC 0.38.
that's odd to say the least and it leads me to the suspicion that maybe my transaction to ribuck was entered only once but executed twice. I don't know. @ribuck: how much BTC did you receive from me? ok, so you placed an order. No inidication (afaik) that any trade happened. still totally unclear why that would result in some automatic order generated on my side. Maybe it's just your order displayed in my notifications for reference that someone put an order regarding "my currency"? Strange indeed, I have no clue. Maybe this stuff is all explained on the wiki, but I cant imagine they expect everyone to study that thing like the bible before they start using it. Bear in mind that the trust lines are there to be used, even while you are not online and so on. Possibly with the various lines of trust you lot have set up among yourselves RIpple has found routes you did not think of or know of. If none of you has complete information about all the lines the others have set up, but Ripple does, maybe none of you individually even has enough information about the combined trust network you collectively have built so Ripple is able to surprise you. Indeed presumably it is hoped and intended that pleasant surprises become more common as trust networks become richer and more connected. So there probably should come a time when Ripple starts getting what we want done done in surprising ways whose details might involve obscure links between people none of whose direct trust line partners we even know or even know of. If you extend a 1 BTC line of trust to someone, they can use it at any time. Would assume that's why it's advised not to do it until you understand what's happening. Where the system fails a bit is in not notifying user A WHY their 1 BTC is about to be (possibly - if the order fills) used. Bottomline is if you extend trust to others for X BTC then be aware that at ANY time X BTC (or X BTC worth of IOUs) you own can vanish to be used by those others (and would be replaced by IOUs from the people you extended the trust to). When you trust someone for X BTC think of it is as you saying "You're entitled to take X BTC from me at any time you choose in return for an IOU as I trust you to repay it". When you think of it in those terms you'll soon realise you shouldn't be extending trust other than when you WANT it to be used. Trust isn't some vague thing like on the WOT - it has a defined and realisable value. If you trust someone (person X) then someone else who doesn't but who trusts you (person Y) can use your trust to lend to X with YOU responsible for repayment to Y (and YOU assume the risk of default by X - as Y holds an IOU from you and you hold an IOU from X). Correct me if I'm wrong - I'm also new to Ripple (and not handing out any trust until I need to). Why would anyone extend credit to friends of friends without a return ? To me, the only people who would benefit from this is the people receiving free loans. Just the kind of people who wouldn't pay it back. I'm looking at the people behind it and they look very credible, so I'll have to assume I don't get it. So please give it to me simply. People are extending credit at present to test the system - not to make a profit. Provided they do it with sums they don't mind losing that's no problem. The Ripple system doesn't force you to extend trust without charging interest (or gaining benefit in some way): that some people are doing so isn't a failure of the system, more a failure of people to realise that doing so isn't actually a great idea. Most people using the system will likely NEVER actually have a good reason to extend trust to anyone other than a gateway. You have to think of extending trust as being the same as providing a line of credit: and price it appropriately. The use of the word "Trust" is perhaps unfortunate - as a lot of users are going to misunderstand it and then get bitten hard by it. If I 'trusted' you enough to lend you 10 BTC I absolutely would NOT extend 10 BTC of 'trust' to you in the Ripple system for free. I'd maybe do it if you paid me a 1 BTC fee up front and agreed that the line of credit would only be available for 2 months. That's how I see Ripple being used - not as some WOT type thing with lines of credit in place everywhere all the time. Where I see massive issues is the first time a gateway gets hacked/gos rogue and is no longer able (or willing) to honour its IOUs. In my view, Ripple's long-term future hinges very much on that not happening until it's gained very significant traction. An early gateway default would kill it. Remember last time bitcoin was up near $32 ? I doubt it was concerns about its baked in block size limit that caused the massive loss of confidence that ended up taking until very soon now, any day now, to get back that level of confidence. I suspect a lot of it was the huge defaults, whether premeditated or due to sheer incompetence or due simply to being out there on the internetz for the whole internetz of haxors to PWN. So yeah, I think we have seen that major defaults can cost quite a bit of public confidence resulting in even years, not mere months of work to regain that confidence. There is a return, it reduces the cost of payments and it helps your friends out. Social structures will probably have to adjust to make this work, just like they did when people started friending each other on social networking sites. I believe that over time this may change the way people think about money, but I'm not ready to advise people to start using it yet. We need to learn *how* to use it. If fact you don't extend credit to friends of friends anyway. You extend credit to friends. They can then choose to use that credit to extend credit themselves to their friends (your friends of friends) - but you don't end up with an IOU from anyone you haven't personally extended credit (trust) to. If the friend of a friend defaults, you still own the IOU from your friend. If they then won't honour it because they were defaulted on they aren't much of a friend and you need to evaluate better how you're handing out trust/credit. But I'd advise strongly against thinking of it in terms of 'friends' anyway - this isn't about friendship, it's about money. What if I wanted to use bitcoins I have in cold storage as collateral for Ripple trust? The person who grants me the trust can verify that the amount of IOUs matches the balance of the address and I can sign a statement to prove ownership. Is there some automated way in Ripple to validate collateral so that the lender can verify that I haven't pledged the same unspent output multiple times? I can't even trust the giveaway thread to give me the 50K ripples. Alright so I "deposit" 1000xrp and into Bitstamp and now I have no idea where it is. Any help folks? Would be nice if some of you would respond my trust! Ripple's just a ledger system that records who owes what and who has offered what trust. 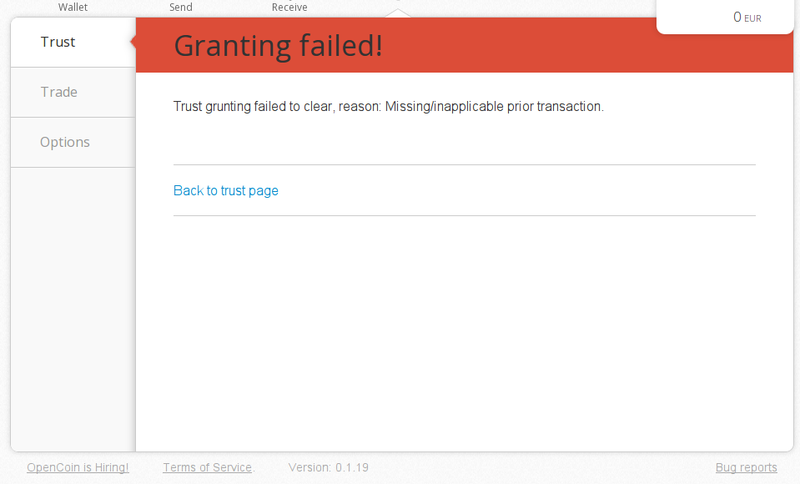 It doesn't enforce or validate extended trust. Making life easier for honest people to conduct business also makes life easier for scammers - Ripple will be the scammers' best friend if it takes off (same as BTC was/is). Fast, easy and irreversible transfer of funds is good for those doing legitimate business but an absolute god-send for scammers. If you legitamtely want to take out a loan against BTC in cold-storage then send them to cold-storage belonging to the lender. If a lender has no way to gain control of collateral in case of default then it's not collateral anyway: just proof that you, in theory, have the means to honour your debt.